This high magnification picture shows a neuron from part of the mouse brain affected by an experimental stroke. 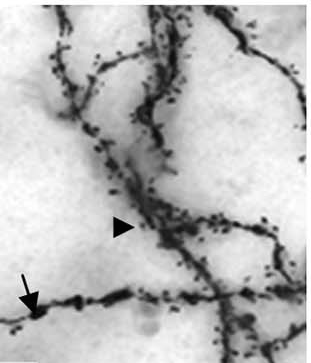 The loss of blood flow causes dendritic spines (arrowhead) to retract and thicker dendritic varicosities (arrow) to appear. A clot dissolving drug called uPA appears to promote the recovery and regeneration of dendritic spines after a stroke. Researchers at Emory University School of Medicine have identified a protein released by neurons while the brain is recovering from a stroke. The results were published online Oct. 22 in Journal of Neuroscience. The protein, called urokinase-type plasminogen activator or uPA, has been approved by the FDA to dissolve blood clots in the lungs. It has been tested in clinical trials in some countries as a treatment for acute stroke. The Emory team’s findings suggest that in stroke, uPA’s benefits may extend beyond the time when doctors’ principal goal is dissolving the blood clot that is depriving the brain of blood. Instead, uPA appears to help brain cells recover from the injuries induced by loss of blood flow. Treating mice with uPA after an experimental stroke can improve their recovery of motor function, the researchers found. uPA (urokinase-type plasminogen activator) and tPA (tissue-type plasminogen activator), the drug that is the only approved treatment for acute stroke, have similar names, because they both act biochemically to activate plasmin, which directly dissolves blood clots. Co-first authors of the paper are postdoctoral fellows Fang Wu, PhD, and Ramiro Echeverry, MD, and pregraduate student Marcela Catano. The Emory team found that mice that lack uPA do not regain as much forelimb strength after a one hour blockage of the middle cerebral artery, compared with control mice. This suggests that uPA produced within the brain is promoting recovery. In addition, immediate treatment with supplementary uPA after a stroke can boost the recovery of forelimb strength, the researchers found. uPA does not have a direct effect on neurons when they are being deprived of oxygen and nutrients. Rather, uPA appears to help remodel dendritic spines, structures on neurons that are critical for communication. After a stroke, dendritic spines are replaced by swelling on neurons that survive but are close to the damaged area of the brain. In cultured neurons, uPA can induce the re-emergence of dendritic spines after toxic injury that mimics the effects of a stroke. uPA seems to help the neurons’ internal skeletons reorganize. The part of the uPA protein that acts in dissolving blood clots is not necessary for this effect, but uPA’s interaction with its receptor uPAR is required. Yepes says his team is testing whether treatment with uPA can still provide benefits in mice when it is given some time after an experimental stroke, which could provide some hints as how it could best be used clinically. The research was supported by the National Institute of Neurological Disorders and Stroke (NS062073 and NS079331) and Veterans Adminstration Merit Award BX000474. Reference: F. Wu et al. Urokinase-Type Plasminogen Activator Promotes Dendritic Spine Recovery and Improves Neurological Outcome Following Ischemic Stroke. J. Neurosci, 34: 14219-14232 (2014).